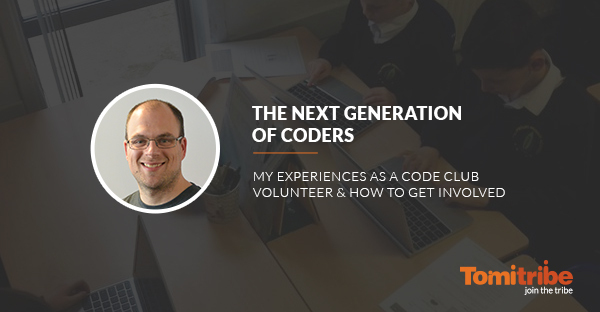 Following on from my Ignite talk at Devoxx UK 2016, I want to introduce Code Club and share my experiences as a volunteer for those that may be interested but didn’t attend the conference. Code Club is a non-profit organization here in the UK that aims at creating a volunteer-led after-school coding club for 9-11 year olds in every primary school across the UK. Each club typically runs for one hour after school, and meets up every week. Coding is featuring more and more on the school curriculum these days, and running a Code Club is a great way to invest in the education of the next generation. When I was between high school and university, I was lucky enough to gain some experience helping out with ICT at some local primary schools. I found it to be a very rewarding experience. On top of that, I actually began coding when I was 8 years old, on an Amstrad CPC 464 that my step-dad bought. I was totally hooked straightaway. However, my primary school at the time (and this is going back a few years now…) had very limited IT resources, and certainly no way to teach coding. As such, all the knowledge I had on Amstrad BASIC was self-taught from a book that came with the computer, and a monthly copy of the “Amstrad Action” magazine, that I managed to convince the local newsagent to charge to my parents newspaper account. An after-school coding club wasn’t even something I would ever have even dreamed of back then, so when I saw Code Club advertised, I had to find out more. When I signed up, my old primary school, Arbours Primary Academy got in touch, so I have been fortunate enough to run a club at the school I, myself, used to attend, making the experience even more special. Getting involved in Code Club is extremely straightforward, and you do not need any previous experience to get started. Here’s how to begin in five easy steps. Ask your employer. In my case, Tomitribe is very keen to help me run a Code Club, and has provided the flexibility to do so. Sign up on the Code Club website. They’ll need to know your name, postcode, and whether you’re employed, or a student etc. Find a school! Code Club can find schools near you based on postcode, and you can reach out to them, or alternatively, local schools can find you. Once you have connected with a school, meet up and work out the logistics – timing of the club, how the material will be printed and the hardware the club will use. Complete a DBS check. If you haven’t come across DBS before, it stands for Disclosure and Barring Service, and is basically a criminal background check. Your school will be able to arrange it for you, and the whole process is carried out online by completing some simple web forms. The school will also need to confirm to Code Club that they have public liability insurance coverage for the club. Run through the online training videos and quizzes on the Code Club website. These cover safeguarding children and some tips on the actual running of a club. These typically take a couple of hours to complete. The thought of running a club might sound a bit daunting, but it is actually pretty straight forward. For starters, you don’t need to come with your own training materials and exercises; Code Club provides all of that. You just need to login to the site, and download the PDF instructions to print for the club along with any supporting material. I usually spend about an hour on a Sunday evening running through the exercise and actually doing it myself, so I’m able to demonstrate it and answer any questions. At the actual club itself, on Tuesday afternoons, I usually spend 10 – 15 minutes doing a short recap and quiz on the previous week’s exercise, to make sure everyone remembers it, and no one has got lost. I can answer any questions that may come up. Then I’ll talk briefly about the next exercise and get the children working on it. At our club, we use Chromebooks and all the exercises covered so far (we have done Scratch and HTML/CSS) can all be completed online without requiring any additional software to be installed. I can then help small groups or 1-on-1 with any questions that come up. Our club has around twenty 7 to 11 year olds, which is quite a big group with a range of abilities, and it can be tricky to get round to everyone. I try grouping students together, or helping the whole class if I see common issues cropping up. I would encourage anyone who is able to run a Code Club to do so. If you’re not in the UK, check https://www.codeclubworld.org/ and see if there is a Code Club presence in your country. It is a hugely rewarding experience and I am consistently blown away by the enthusiasm that both the children and the school itself have for the club. The children love to find new ways to customize the Code Club exercises, in new ways I cannot possibly imagine myself. As it is an after-school club, the children who come along are very keen to learn to code, and they appear to enjoy the club. They’re also very honest, so if they say they’re enjoying it, they aren’t just being polite. If they are stuck or not enjoying it, they’ll say, and you can adjust accordingly. Above all, it really is so easy to get involved – just ensure that you can commit the time, sign up, connect with the school, and enjoy. Prior experience is not necessary. Previous PostIs Jigsaw Dead? Not quite. Next Post"I do not hate Apache Maven"